Nestle Kit Kat chocolate mint swirl is a great combination of flavours in a Kit Kat.I love the original but l also loving this new flavour! 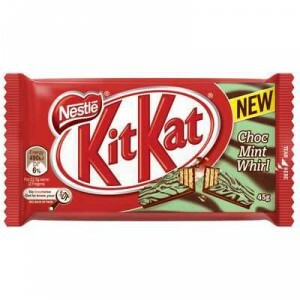 Nestle Kit Kats are so delicious and the only way to make them any better is to have them in mint flavour! I love mint and love this mint Kit Kat. I love to snap Kit Kats and slowly eat each piece of a Kit Kat – mint heaven! How would you rate Nestle Kit Kat Choc Mint Whirl?